ENO DoubleNest LED. ENO and festivals go together like waterfalls and summer. Now you can bring the festival wherever you hang. 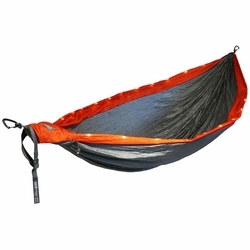 The DoubleNest LED boasts the same top-selling characteristics as the original DoubleNest, but features a fun and festive integrated light strand - with bright, dim and strobe functions - to inject a good time into any hammock sesh. When the party's over, just tuck the DoubleNest LED away in its stuff sack and you're ready for your next adventure. Eagles Nest Outfitters. Dimensions: (Lxw) 9'4" x 6'2"